Airports and train stations look pretty different in terms of security. Why has train security been so left behind despite being vulnerable? In the wake of the September 11, 2001 attacks, the world simultaneously realized something: that our means of transportation had grown quicker than our efforts in protecting them. It’s no wonder that the security technology industry has since boomed and become a cornerstone of how we use transportation. Many of the policies put in place directly after 9/11 still impact airports to this day and much of the focus has been on air travel, and while this is certainly sensical in light of the fact that terror attacks have historically targeted airplanes, it still leaves for some vulnerabilities in other aspects. That’s why today we’re looking at train security and how it has largely been overlooked, leaving many of our transportation systems vulnerable. Airports and train stations are used in considerably different ways. No one is using an airport daily, and even regular travelers who often have to use planes for their work only need to go to one a few times a week at most—meaning that it’s already built into the means of transportation that you’re going to have to wait a while to get through security. In contrast, train stations are used daily by people and having the same kinds of stringent security measures in place for a train station wouldn’t be as practical. However, there has been increased interest in non-invasive security technologies for these kinds of places like metal detectors or access control systems. Not only are trains used every day by passengers, but train security extends to cargo trains as well. 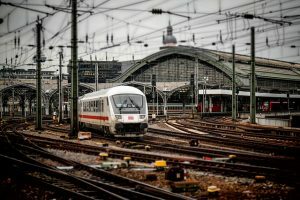 There has been an increase overall in installed video surveillance equipment, trained security personnel who perform inspection, and an increased awareness overall of how train security has become so important. Nonetheless, it’s important to remember just how much cargo still gets shipped via railways and why it’s so critical that we protect that infrastructure. Lastly, it’s important that we’re actually looking at the trains themselves. Just like road vehicles, much of the modern risk that comes with trains is actually their undercarriage, where dangerous modifications could be made or explosives could be attached. To combat this, there’s been a huge wave of technologies responding to this threat specifically—including Gatekeeper’s Intelligent Train Undercarriage Scanner which acts as an immediate threat detection technology. This entry was posted on Friday, December 7th, 2018 at 12:14 pm. Both comments and pings are currently closed.